FilterPod must be aerated in order to provide the microorganisms that clean the wastewater with oxygen. FilterPod is designed to use passive, non electric aeration but this is not always possible, as on some sites, an Air Outlet Vent may not be possible, or effective. In these circumstance a Fan Box can be fitted to the air outlet vent to electrically draw air through the tank and RDX media. tank. From here, the air goes through the primary tank and exits through the top of the soil vent pipe. The Fan Box uses a 12v motor and has a very low power demand of 0.005Kw (5W) which can be Solar Powered if no mains electricity is available. It is the FIRST and ONLY solar powered sewage treatment plant in Europe and we are proud that is our UK product and design. As a 'chimney effect' is no longer needed, it does not matter if the SVP is shorter than 5 metres. No other pipes are required. The annual energy demand is only 45Kwh. In comparison, even an eco electric sewage treatment plant such as Vortex uses 350Kwh per year. Because the Fan Box uses a 12v motor, it can easily be powered by renewable energy. 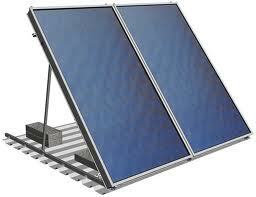 Solar photovoltaic (PV) systems use free energy from the sun and convert it into electricity using photovoltaic cells. Every minute, the Earth receives sufficient energy to meet all power demands for a whole year - if only we could harness it efficiently. PV produces free electricity, on site where it is needed. This is very useful for powering the FilterPod fan if mains electricity is either not available or a long way away. It also saves carbon emissions in the process. There are no moving parts in a PV system and PV is silent in operation. It is also very reliable, minimising the need for maintenance. The modular nature of PV allows for system to be upgraded at any time with ease. How Does PV Solar Power Work? Solar Power works by the action of the sun's rays on solar panels. These solar panels create an electrical charge which is fed to a battery via a regulator, which must of the type that does not draw any power from the battery. PV cells create Direct Current (DC) electricity. The fan is a DC fan, so can use this electricity directly, without the need for an inverter (which would change it to AC current, such as used by domestic appliances). The battery should be large enough to hold 14 days worth of power for the fan. 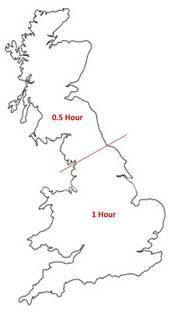 The power requirement is based on 1 hour/day sunshine for most parts of the UK and 1/2hr/day for the rest. Please see the map for general guidance, though individual locations may vary. You need a site with no shading from trees and a good southern aspect. You need PV panels, a regulator (this is sized according to the size of the PV panel) and a battery. Latitude of the site. The sun at mid day in mid winter should be at 90º to the panel. Please see our panel angle calculator for your location. Correct orientation of the panel. It should be facing due South. The panel should be sited in an open site. No shading of the panel by trees, buildings, etc. The panel should be sited in a position where snow can be removed easily. The system must be installed by an electrician who understands 12V and solar systems. The panel, regulator and battery MUST be close together to prevent voltage drop along the length of the cable. The cable MUST be the correct size to avoid 'voltage drop' along its length.